I'm thrilled to announce the annual Nail Art Fashion Week, created by Maria of So Nailicious is back for its second year!! I hope you will join us! If you remember, last year I hosted along with Maria and they were some of my most viewed posts ever! 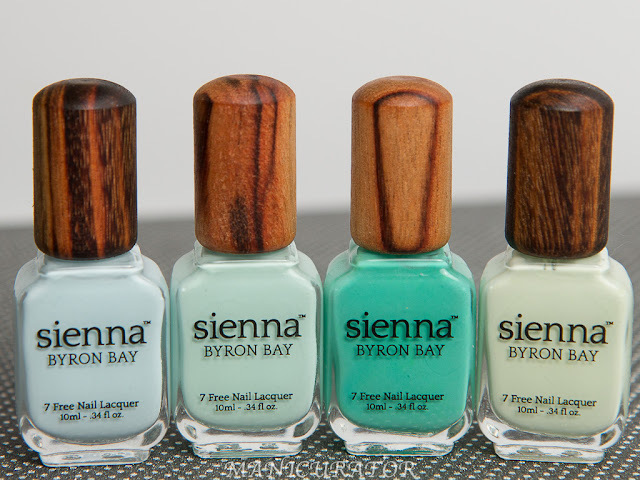 Check out my 2015 fashion week inspired nail art! It's so much fun to create based on fashion inspiration, I look forward to seeing your designs. You can join us for one day or the whole week, whatever works for you. Maria's introduction to the challenge can be found here! April 12 – Shoes: create nail art inspired by shoes. It can be any shoes you like, wear or covet. Preferably from the Fall 2016 collections. You can find shoe inspiration here and here. 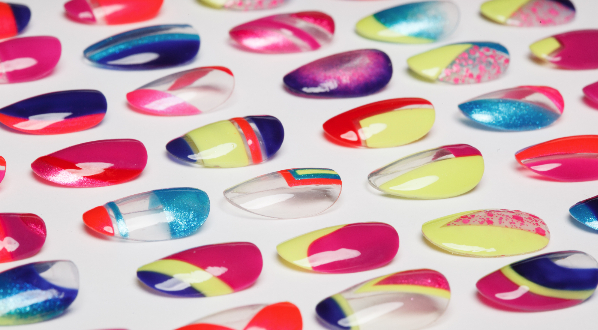 April 13 – Bag: create nail art inspired by a bag. It can be any bag that you like, but preferably from the Fall 2016 collection. For inspiration see here and here, or check this gallery (pick a collection and check their ‘Details’ section) for Fall 2016 bags. 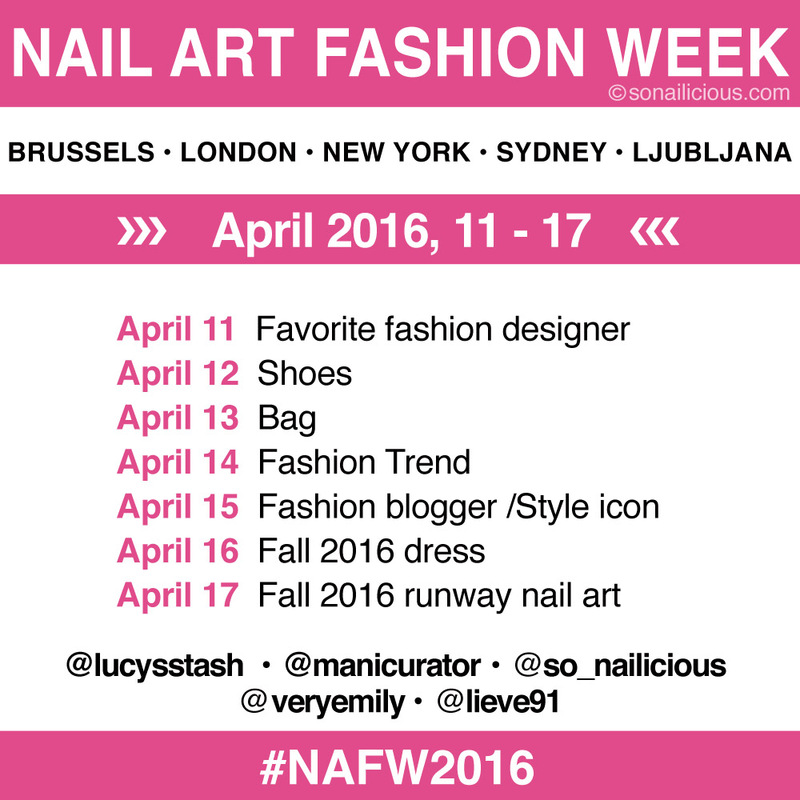 April 14 – Fashion Trend: create nail art inspired by your favorite fashion trend, i.e. florals, colour blocking, nudes, neons, sport chic, etc. April 15 – Style icon: create a design inspired by your favorite fashion icon, i.e. by her/his outfit, her favorite colours or maybe nail art that they wore. It can be an actress, blogger, model or your neighbor – anyone you consider a style icon. April 16 – Fall 2016 dress: create a design inspired by a dress or any outfit seen on the Fall 2016 runways. April 17 – Fall 2016 runway nail art: re-create any nail art from Fall 2016 runways. Check this article and this gallery for more inspiration. Here are our 2016 hosts!! Maria, of course - representing Sydney. Emily VeryEmily from Brussels, Anja Lieve91 of Ljubljana, Lucie LucysStash from London and me! Victoria Manicurator in New York! 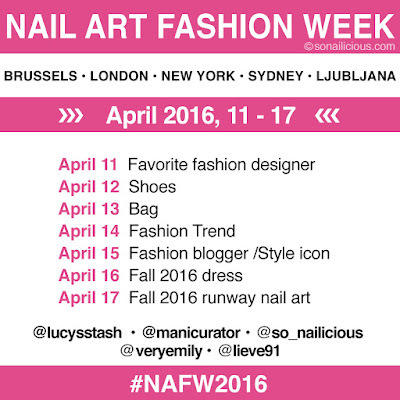 OK, hope to see you tagging us and using #NAFW2016 on facebook, twitter and instagram!